In Flanigan’s hands, each device emitted a range of raspy feedback, which she coaxed with her microphone — a microphone that served the dual purpose of amplifying her voice, a confident soprano that suggested echoes of Billie Holiday in its slurred, mouthy vowels. More often than not, her singing took on the characteristics of a boys choir, thanks to endless permutations of sonic mirroring. The music she performed that evening was drawn from Amplifications, her recent album for voice and speakers that certifies Flanigan as a musician who straddles numerous realms that are often understood as standing in opposition to each other: melody and noise, technology and song, recording and performance. Now, the blending of accomplished female vocals and edge-pushing technology is not in and of itself new. From Björk’s collaborations with the duo Matmos, to Destiny’s Child’s beats provided by all manner of producers, all the way back to the Roaches’ work with guitarist Robert Fripp, there is no small number of examples of accomplished female singers who partner successfully with experimental musicians. What distinguishes Flanigan isn’t merely that she can handle both sides of that age-old equation — what is remarkable is how substantially her vocals and technology meld. For all the haunting lushness of Amplification‘s “Retrobuild,” which is almost entirely made of layers of her singing, it’s the mix of electronic buzzing and lightly mediated vocalizing on the track “Sleepy” where her powers are made fully clear, the way as a composer and performer she blurs the technological and the human, finding a common musical ground that has the drone as its foundation, but that aspires to something song-like. The tools that Flanigan employs in Amplifications are by no means the extent of her output, just a recent milestone in her creative process. She has developed “Bioluminescence,” a live audio/video collaboration with R. Luke DuBois, and documented nocturnal activity in a series of thousands of tiny photographs (titled “In Sleep”). Her “Ravezooka,” produced with Benedetta Piantella Simeonidis, “shoots” audio at a distance, and her “Round Sound” project is an experiment in the visualization of sonic data. 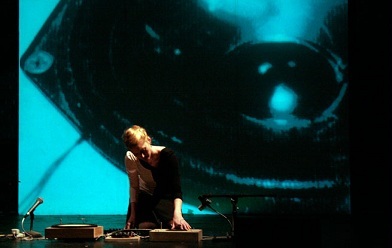 Contacted shortly after the GAFFTA performance, Flanigan took time to discuss various aspects of her work, from the sense of freedom inherent in new technology, to the extent of her musical training, to the sculptural value of her sound objects. Marc Weidenbaum: Do you think your musical training lends an additional depth of musicality to even the noisiest, most seemingly discordant executions on your speaker-instruments? Lesley Flanigan: My musical training is in soprano voice, and the most valuable skills I took from that training were physical things like how to breathe properly and how to sing high notes without hurting myself. Other than that, I don’t really have that much musical training. I have a lot of experience with music – but not much training. I studied art and sculpture in school, so any training that I bring to my work comes more from these places. I think it is my lack of musical training that lends additional depth of musicality to my work, because the music I make depends entirely on my ear. I naturally have a good ear and am not locked into any expectation for a musical timbre. It is my love and respect for classical approaches to music, along with my sculptural tendencies, that compel me to arrange some semblance of musicality out of all the pitches, rhythms, and sounds I hear with my instruments. I use methods that involve my voice as instrument and my experience with composition to do this, but my ear does most of the work. My music is simple. Whether pop, experimental, or classical, my music all comes from the same process of throwing down a palette of sounds and then intuitively organizing them. With my work now, I’m more transparent about the process. The process is the composition: noise to sound to music. It’s sculptural music. Weidenbaum: I’ve read that Nam June Paik once witnessed Karlheinz Stockhausen rehearsing a performance with an orchestra, and Stockhausen called out to a specific musician that he was playing a note incorrectly — a slight infraction, like a flat instead of a sharp. Paik said he realized at that moment that he’d never have that level of musical fluency, and decided to go into an area that fascinated him and was uncharted, the art of technology. Listening to your work, I am reminded that what Paik saw as two different creative realms can, in fact, be bridged. How does that resonate with you, the divide that Paik suggests between musical fluency and new-media innovation? Flanigan: I think the divide is simply between that of fluency and innovation. Ultimately, any good art, or artist, balances both. What is nice about working in a relatively innovative sphere is that the only baggage and expectation you bring to the work are your own. Innovation is fresh. On the flip side, working in a sphere of fluency carries with it the presence of history — a known, trusted, and shared language, which is so special to have embedded in any work of art. Fluency is comfortable. It is hard to be innovative in a comfortable place, so in my experience, it is easier to bridge the divide by moving from a place of innovation towards a place of fluency as opposed to the other way around. And so it makes perfect sense for Paik to have been drawn to the art of technology, because technology is by definition, innovative. He was completely free to make up his own language — and to then achieve fluency in his own language. I can relate. Building my own electronics and instruments and making music out of noise, I get to develop my own language. In hindsight, I probably gravitated towards this genre of work for similar reasons as he did. I don’t feel I have the “expert” music techniques and skills that many of my peers have, but by working with things I do feel I’m good at — listening, building, and connecting — I have found myself working very intimately with music, in my own way. I feel a little more safe to be experimental and free to make music by arriving at it from a strange place. Music and technology are inherently interconnected. Music is made from tools and instruments, which are the result of technical exploration. The fact that one person can work independently to write, record, and produce music that sounds like an entire orchestra — and the fact that anyone would even conceive of making such music — is a result of the existing technology. The technology opens up doors to new music, while simultaneously giving historic presence and meaning to older methods. One of my personal interests is in how we hear sound (acoustic versus processed). So many advances in recording technology have been about getting the perfect, clean sound where we hear no noise whatsoever. And yet, as a result of moving closer to that big, perfect production, there grows a real nostalgic love for hearing the sound — the noise — of old, crackling recordings. These recordings are not just the music, but the space of the music. All the noises have, over time, become part of the music. They are “musical.” You can hear that influence in noise and post-rock genres. Weidenbaum: Regarding the constituent parts of your speaker-instruments, are there any materials involved that didn’t exist 10, 15, 20 years ago? 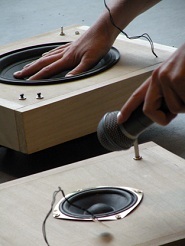 Flanigan: I originally designed the six instruments (the ones I use on the album and you saw in performance) to interconnect with each other and with a computer so that I could program software to have the speakers perform themselves and record their sounds remotely (there are two switches on each instrument for this purpose). So yes, in this way, they do involve materials that are new. But I stopped working with those components a year ago, for several reasons. One was very practical – I just got fed up tinkering with the circuit and troubleshooting it constantly. The other was conceptual – my interest grew to be more about the physicality of sound and less about the designing a fancy performance with technology. I wanted to make music with my instruments, and the most direct path to this was to grab a microphone and play. Many more meaningful sounds, techniques and ideas came to me through this process than from the process of sitting behind my laptop. Currently, the parts I use are the speakers, piezos, amplifying circuits, switches and potentiometers. But the other stuff (microcontroller connected to Max/MSP software on a computer) is there… and I’ll probably return to it again when I have something to say with it, perhaps in an installation form. Weidenbaum: From the performance I saw in San Francisco late last year, there is an aspect of performance to what you do, not just performance as in the live singing and working with your speakers, but also a kind of theatrical element. What are your thoughts on the role of theater in your live work? Flanigan: I don’t think my work is theatrical. My performance is transparent in that you see what you hear. No magic. I am performing with amplification, so there is a staging and choreography that I work out for each composition, which changes a little with each show as I take into account the size/shape of the performance space, the amplification of the room, and how the speakers should be situated in order to communicate the ideas (and the sounds) of physical amplification. I work not only with the sounds from my speaker instruments and voice, but also with the sounds near and far in the air. I move around quite a bit to do this. And as each speaker is self-contained with its own sound getting moved around, they also hold their own physical presence on stage. I think of them as members of a choir. I try to be honest and real with my performance as the process of making the music, and I think it is pretty much the same as me working in my studio alone. Weidenbaum: Your comments about “fluency” are particularly interesting. Have you, in the past, been involved in spheres that have gotten codified, too routine, and then actively chosen to leave them behind? Is that one of the reasons you didn’t pursue soprano voice? Flanigan: I take an active role in understanding my work process and try to make conscious decisions about what I’m learning and making and what I am avoiding as far as spheres that feel too codified to me. When I am working on music I am often interested in visual art and when I am working with electronics I am interested in acoustic music. I allow my brain to separate and find connections between different creative spheres as a way of staying fresh and open to ideas, so as not to slip into the pressure of trying to live up to “codified” expectations. I give myself space to focus. But my choice to not pursue soprano voice was more that I didn’t know what to do with the skills I had and was uninspired by the few possibilities I saw. I also struggled with what I felt as a division between “my” voice versus “soprano” voice. During the time I was studying voice, I was interested in more experimental, pop and electronic music. I was listening to Aphex Twin and Tricky. The singers that most influenced me were women like Björk and Elizabeth Frasier and classic jazz singers like Nina Simone and Sarah Vaughn. While I loved the physical challenge of singing opera and learning classical techniques, I always returned to my way of singing and it all felt very compartmentalized – a “this way or that” or “right versus wrong” approach to voice. I didn’t know the work of Joan La Barbara and Meredith Monk and other vocalists who bridge a classical approach to voice and composition with experimentation. If I had been exposed to their work and ideas, I might have done things differently. But as it was, I lacked interest in pursuing classical voice because it seemed like a set skill with little room for improvisation and emotive feeling apart from rehearsed technique and clear-cut lyrics. I don’t see it that way anymore. I see so much to explore in classical voice; the possibilities are overwhelming. Because If you cut away all the notions of genre, style, technique and fluency, voice is just another way to produce and express sound – but with more potential and nuance than any other instrument because every voice is unique. There really is no standard of measurement. 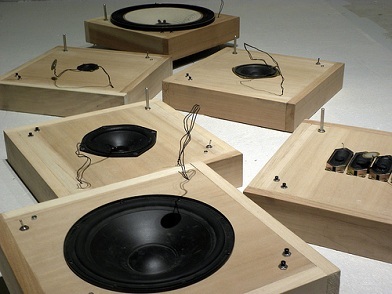 Weidenbaum: Voice is a subject of much discussion in the realm of electronic music and sound art. As Pauline Oliveros has noted, the human voice is so rich with overtones, it is simply more complex than any other instrument, and thus can’t help but stand out. Do you temper your voice at all, so as to not overwhelm your instrumentation? Flanigan: I am most successful in my performances when I temper my voice with my instrumentation because I want the voice to be a part of the whole sound, not dominate it. I am interested in choral ideas in my work – individuals creating a whole. The more pre-planned or composed work I do that is easier to temper than my improvisations. This is because it is so easy to fall back on pushing voice when I get insecure about the direction of a performance. I see that the complexity of voice comes from the fact that it is a direct translation of emotion to air. Voice is not about words, it is about feeling. It’s tricky to temper voice during an improvisation because I’m not just navigating the sounds I hear, I am navigating my feelings about how I’m putting them all together, and my voice is what tells the story of that process out loud. It’s like having conversation or argument and analyzing all the things you are saying (or how you are saying it) in the moment. Weidenbaum: Your speaker instruments are beautiful just as objects — they’re plain and simple in a manner that, visually, signals them as elemental, fundamental, solid, whole. They were installed as sculpture at Massachusetts College of Liberal Arts’ Gallery 51 earlier this year — how do you feel about them being presented as inanimate objects? Flanigan: Ultimately, for the context of the Gallery 51 show, I think they worked just fine. The show was about merging the boundaries of art and music, and my speaker instruments definitely speak to those ideas. I love my instruments as sculptural objects – a lot of care went into building them and they do present the simple tangibility of electronic sound through their form. They demonstrate the physical relationship between microphone and speaker, and feedback as being a kind of voice. These ideas are important in my work. Their form is also “individual” and conveys a presence of individuality within a group – the idea of voices within a choir. But on my own personal level, I’m still figuring out how I feel about them being presented as inanimate objects. 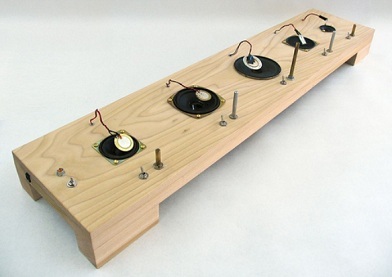 I originally built my speaker instruments to stand on their own as a sculptural sound installation. But after performing with them so much, they have evolved to become more instruments than sculptures. And more than just being instruments, they are my instruments. So much so, that for this show I had them stand silently on their own because I didn’t want them making any sound without me. Maybe there is something about the absence of a voice that speaks volumes, but I’m not convinced that’s what they express. So these are ideas I’m now exploring through new work. Weidenbaum: How much is your music born of improvisation, and how much is it a matter of a planned, structured approach to composition? Perhaps you could select one piece from Amplifications and talk about how you came to compose it? Flanigan: It depends on the piece. For example, “Thinking Real Hard” is very much a composed song. It has lyrics, a verse-chorus style structure, and a clear beginning and end. There is improvisation, but not much. I have one speaker that I work with on that song, and I know exactly the range of tones I can get out of it. It’s a very reliable speaker. Then there is a piece like “Snow,” which was entirely improvised within a mapping I outlined for myself. It was well thought out. Overall, this piece was made considering the amplification of the space I performed it in. I thought about the size of the space and the capacity it held for reverberance. I wanted sound to move through the space and finally disappear into the air. The score/mapping was a linear path of moving from speaker feedback noise to dense choral voice, with a conceptual arc of “noise to sound to music.” On a more detailed level, I considered timing and motion between speakers. For example, I’d follow directions such as “perform speaker A for 10 microphone sweeps, then walk over to speaker B, turn it on and carry it to the center of the room, then position its microphone to give it a low, barely audible rumbling sound before walking over to play speaker C for 10 microphone sweeps.” I knew which speakers to work with and how to play each one to bring out elements of tonality, noise and rhythm I wanted to hear. The sampling and layering of their sounds were intentionally obvious, methodical and dense. But with all that said, I could have never predicted the exact sounds that would come out of the process”¦ many variables effect the feedback I work with, so no matter how much control I have planned, improvisation is always at the forefront. I work best when I work intuitively, listen intently, and simply sense the “right” moves to make. And you can’t compose intuition, you just have to make space for it to exist. There are times that intuition simply doesn’t kick in or when I can’t hear what I need to hear. That’s when I risk overcompensating, singing too loud, or generally losing myself. Rehearsal for me is the practice of trusting those moments of doubt and confusion as not being the end, but a time to just listen harder and let go. Build, break and improvise. 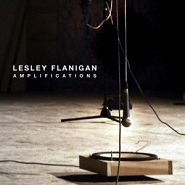 More on Lesley Flanigan at lesleyflanigan.com. Her work was previously featured on this website back in early January (disquiet.com). Thanks for introducing me to Flanigan. Really talented. Nice interview. Great stuff, really good. Thanks!